In this third book in the series, Jess now has to juggle her boyfriend troubles, an evil substitute teacher, perpetual tardiness, and taking her granny to the doctor's office without underpants. There's a barely-English-literate Japanese boyfriend for Jess's mother and a variety show for good measure. Much hilarity ensues. 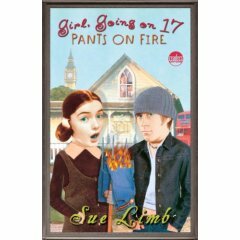 The first book in the series was funny, albeit a bit silly at times, but it is harder to accept the proposition that Jess is still so immature yet now actually 17 years old. She always seemed a bit babyish, but now she seems to act like a tween (at best!). I've noted before that British YA seems to be a bit less mature than American. This is a classic example. Sadly, Limb's little franchise is losing steam.